Two days before President Abraham Lincoln issued his 15 April 1861 call for volunteer troops to help defend the nation’s capital (following the fall of Fort Sumter to Confederate forces), residents of the counties of Lehigh and Northampton in Pennsylvania “called a public meeting at Easton ‘to consider the posture of affairs and to take measures for the support of the National Government,'” according to Alfred Mathews and Austin N. Hungerford, authors of History of the Counties of Lehigh and Carbon, in the Commonwealth of Pennsylvania. Worried about the worsening relations between America’s North and South, the citizens voted to establish and equip an entirely new military unit, one that would be readied for duty as quickly as possible – a decision which proved to be remarkably prescient. Several of the men in attendance that evening, including Charles Heckman and Samuel Yohe, had already begun recruiting local militia members and other volunteers to fulfill this charge and protect the nation’s capital if needed. Yohe, the owner-operator of a local distillery, mill and store in Easton who had also served his community as an associate judge, county treasurer and prothonotary, was the commanding officer of the Washington Grays, an Easton-based militia unit. The same day that President Lincoln called for volunteer troops, these same community leaders then contacted Pennsylvania Governor Andrew Curtin to volunteer the support of their local recruits to the Keystone State and nation. Three days later, these experienced militia members left hearth and home to head for Dauphin County. There, on 20 April 1861, they officially mustered in at Camp Curtin, a military training camp on Agricultural Society land in northern Harrisburg, and became members of the 1st Regiment, Pennsylvania Volunteer Infantry. While Yohe’s Washington Grays were ordered to form Company C of this new regiment and Yohe was commissioned as the regiment’s new Colonel, Thomas W. Lynn and Tilghman H. Good were awarded the ranks of Major and Lieutenant Colonel, respectively. George Warren Alexander and William H. Gausler, the captains of the Reading and Jordan Artillerists, were placed in charge of Companies G and I, respectively. * Note: Tilghman Good, the commander of the 4th Regiment, Pennsylvania National Guard at the time of his appointment to the 1st Pennsylvania’s command staff, had previously served as Captain of the Allen Rifles, a long-time Lehigh County militia unit that had been formed nearly two decades earlier (in 1849). He would later go on to form his own regiment (the 47th Pennsylvania Volunteers) during the summer of 1861 and, later in life, would also be elected to three terms as Mayor of Allentown. G. W. Alexander would be commissioned as a Lieutenant Colonel with the 47th Pennsylvania and named Good’s second in command while William Gausler would also serve with Good’s 47th Pennsylvania command at the rank of Major. Transported by Northern Central Railroad cars with their regiment to Cockeysville, Maryland via the Northern Central Railroad, the 1st Pennsylvanians then spent time at Camp Scott near York, Pennsylvania before being ordered to railroad guard duties along the rail lines between Pennsylvania and Druid Park in Baltimore, Maryland from 14-25 May. From there, the 1st Pennsylvanians were assigned to Catonsville (25 May) and Franklintown (29 May) before being ordered back across the border with their regiment and stationed at Chambersburg (3 June). There, they were attached to the 2nd Brigade (under Wyncoop), 2nd Division (under Keim) in General Robert Patterson’s Army. Ordered on to Hagerstown, Maryland on 18 June and then to Funkstown, Goose Creek and Edward’s Ferry, the regiment remained in that vicinity until 22 June, when it was ordered to Frederick, Maryland. 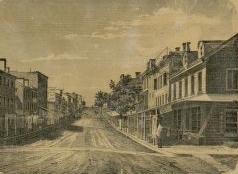 Assigned with other Union regiments to occupy the town of Martinsburg, Virginia from 8-21 July (following the Battle of Falling Waters earlier that month), the 1st Pennsylvanians were ordered to Harpers Ferry on 21 July. Following the completion of their Three Months’ Service, they honorably mustered out on 23 July 1861. Led by Captain Jacob Dachrodt, who was a former member of the Easton Fencibles and Easton City Council during the 1850s and organizer at Lawall’s Hotel of the Citizens’ Artillery in that same city in 1856, Company B was largely made up of experienced local militia men, but also included other “green” (inexperienced) recruits from the greater Easton area of Northampton County, Pennsylvania. Upon honorable completion of their Three Months’ Service, many B Company men then opted to re-up for service, including Captain Dachrodt who became Lieutenant Colonel of the 153rd Pennsylvania Volunteers and went on to serve in the Pennsylvania Senate from 1887-1890. Three of his siblings also fought for the Union during the Civil War, including his youngest brother, Daniel Dachrodt, who rose through the ranks of the 47th Pennsylvania (from drummer boy to Principal Musician), and then ultimately became that regiment’s last surviving member. Just one day after President Lincoln’s call for volunteer troops to defend the nation’s capital following Fort Sumter’s fall, Captain G. W. Alexander offered the services of his Reading Artillerists to Pennsylvania Governor Curtin (on 16 April 1861). Like the majority of their fellow 1st Pennsylvanians, the Artillerists were officially mustered in for duty at Camp Curtin (on 20 April 1861). And like the majority of their fellow 1st Pennsylvanians, they were honorably discharged from the regiment at Harrisburg on 23 July 1861 upon fulfillment of their Three Months’ Service. Most of the Reading Artillerists then opted to re-enroll for three-year tours of duty, but did so under different commanding officers. Many served with great distinction and many, like William H. Andrews, gave their lives to preserve America’s Union. Andrews, who had been commissioned as Captain of his own unit, was killed during the Battle of Antietam on 17 September 1862; he was then succeeded in the command of that unit by fellow Reading Artillerist Thomas Richards, who survived and was honorably discharged with his men on 19 December 1863. During the 13 April 1861 meeting of Northampton County residents, community leaders also placed their faith Tilghman H. Good. in charge, assigning him the rank of Lieutenant Colonel, a rank that was confirmed when Good officially mustered for duty in at Camp Curtin in Harrisburg as members of the 1st Pennsylvania Volunteers. His recruits were then incorporated into the same regiment, mustering in at Camp Curtin on 20 April 1861. With Good ordered to help helm the region’s newly formed 1st Regiment, Pennsylvania Volunteer Infantry, the Allen Rifles and G Company needed new, but experienced leadership – and quickly. William H. Gausler was the man chosen for the job. In charge of the Jordan Artillerists at the time of his appointment to lead Company I of the 1st Pennsylvania Volunteers, Gausler would later be called on again by Good to help establish the 47th Pennsylvania Volunteers during the summer of 1861. According to Lewis Schmidt in his A Civil War History of the 47th Regiment of Pennsylvania Veteran Volunteers, as the 1st Pennsylvania Volunteers came together, “These two units [the Allen Rifles and the Jordan Artillerists] combined their forces as the Union Rifles to meet the request of the state that units arriving should have at least 100 men on their muster.” Although officially known as Company I, the 81 officers and men of this particular company were still frequently referred to by their long-standing designation (the “Allen Rifles”). Upon fulfillment of their Three Months’ Service, the men of Company I were honorably discharged, mustering out at Harrisburg on 23 July 1861. Many still loyal to their former “Allen Rifles” captain and 1st Regiment commanding officer, Tilghman Good, answered the call to arms yet again just weeks later as Good began recruiting for his 47th Regiment, Pennsylvania Volunteer Infantry. This time, they would be in service for the long haul and headed deeper into Confederate territory than they could have ever imagined. See also: Allen Rifles, Jordan Artillerists, and Union Rifles. 1. Bates, Samuel P. History of Pennsylvania Volunteers, 1861-5; prepared in compliance with acts of the legislature. Harrisburg, Pennsylvania: B. Singerly, State Printer, 1869. 2. Deegan, Jim. The Dachrodt Brothers of Easton, in Lehigh Valley Live. Allentown, Pennsylvania: http://www.lehighvalleylive.com, 28 August 2011. 3. Lovenstein, Lochard H. In Lieu of a Draft: A History of the 153rd Pennsylvania Volunteer Regiment. Bloomington, Indiana: AuthorHouse, 2012. 4. Mathews, Alfred and Austin Hungerford. History of the Counties of Lehigh and Carbon, in the Commonwealth of Pennsylvania. Philadelphia, Pennsylvania: Everts & Richards, 1884. 5. Montgomery, Morton Luther. Historical Sketch of Reading Artillerists: Upon the Occasion of Their 102nd Anniversary in Metropolitan Hall, May 26, 1896. Reading, Pennsylvania: Press of James E. Norton & Co., 1897. 6. Schaadt, James L. Company I, First Regiment Pennsylvania Volunteers: A Memoir of Its Service for the Union in 1861, in The Penn Germania: A Popular Journal of German History and Ideals in the United States, vol. 1, no. 1. Lititz and Cleona, Pennsylvania: H.W. Kriebel, editor. Holzapfel Publishing Co, 1912. 7. Schmidt, Lewis. A Civil War History of the 47th Regiment of Pennsylvania Veteran Volunteers. Allentown, Pennsylvania: Self-published, 1986.